Has any artist had a run like Pollard since striking out on his own with the launch of GBV INC in 2008? With the release of Moses On A Snail, Pollard has put out an unbelieveable 12 albums in a roughly 2-year span. That's not including all of the various EPs, singles, and a (third) box set of outtakes and unreleased tracks. 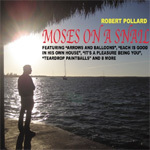 Moses On A Snail contains a dozen amazingly strong Pollard compositions. Even for this ridiculously prolific songwriter, this was a notable writing session as 10 of the 12 songs were written in one sitting. As Pollard describes the process, he started with a notebook of working song titles, and penned 22 songs in a single afternoon's creative burst. He discarded 12, and ten songs were picked to later revise and flesh out. He made demos to send to frequent producer / collaborator Todd Tobias, who recorded the instruments before Pollard recorded his final vocals. This batch of songs finds a somber, more reflective, yet ultimately triumphant Pollard on such instant classics as "Arrows and Balloons", "Each is Good in His Own House", "It's a Pleasure Being You", and the enormous title track "Moses on a Snail" which culminates in a dramatic (and atypical) minute-long guitar lead to close the album. Elsewhere, the elegiac "Teardrop Paintballs" is a seriously heartbreaking melody, and the (dare we call it) mellow opener "The Weekly Crow" reminds us to tell you that there will be a Pollard composition on the forthcoming Glen Campbell album. Clocking in at a concise 36 minutes, Moses on a Snail begs to be played over and over again as it reveals itself more with each listen. It's an album that begs the question: "What is Robert Pollard going to do next to top this one?"